While work on the magazine was halted, the Bureau of Ordnance completed a survey of Fort Norfolk showing the existing buildings and the future sites of the magazine and the keeper's house (Bureau of Ordnance 1852) (see above). 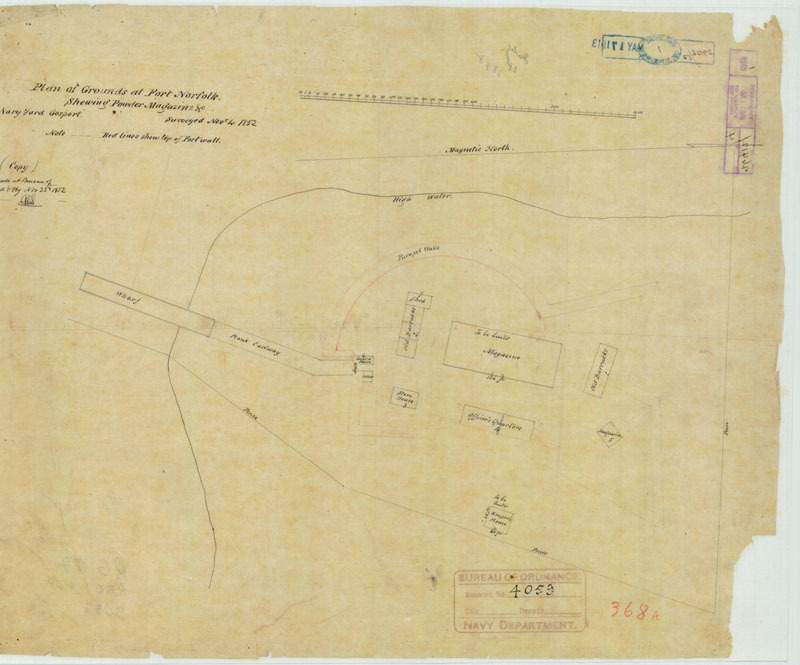 Lieutenant Robert T. Scott of the Bureau of Ordnance prepared the survey and filed a report on the condition of the Fort Norfolk buildings. Generally, Scott found "all the buildings in a very dilapidated and decaying state, both internally and externally." He found the old barracks at the rear of the fort (labeled as Building I on the plat) to be "a mere ruin." It had lost one of its gable ends as well as doors, sash, and shutters. Inside, the floors were "utterly decayed" (see above). The barracks nearest the guardhouse (Building 2) were in somewhat better condition, but the attached shed (Building 7) had neither roof nor floor. The officers' quarters (Building 4) were then occupied by the "keeper of the premises," but the building was still in poor condition even though it had been recently shingled (BY&D, Letters Received, Box 157, Scott to Breese, November 17, 1852) (see above). Scott observed that the foundation of the magazine was complete and that the "first course of Tablet for the entire Building had been prepared." The joiners, he reported, had made little progress on the magazine other than to "commence the centers on which the arches are to be turned." Apparently the work stoppage was caused by the lack of money to pay the workers. Scott declared that "the materials for these buildings are on hand and ready for use at any moment" (BY&D, Letters Received, Box 157, Scott to Breese, November 17, 1852).